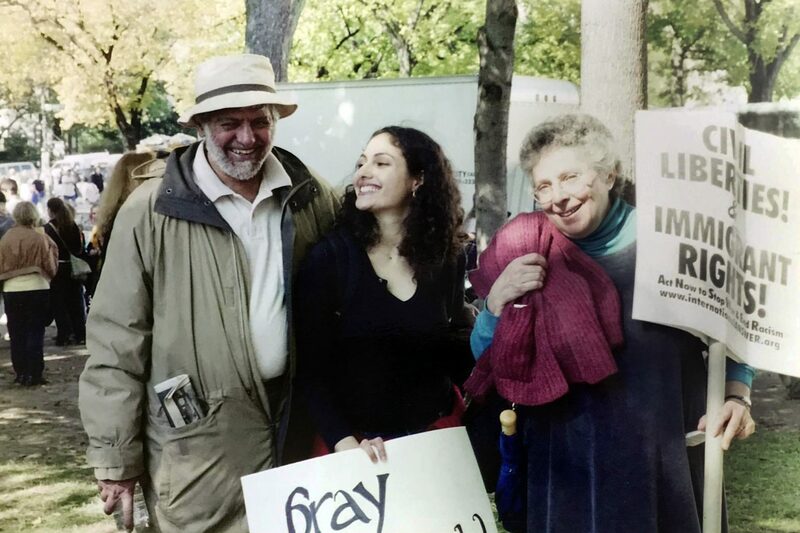 The writer and her parents at a protest. Photo courtesy of the writer. ON A NOVEMBER Shabbos four years ago, my dad, Rajendrapura Seetharamaiya Krishnaswamy, died of cancer. My family gathered at his hospice; I left them to drive to shul, where I stood for the Mourner’s Kaddish. The words were unfamiliar and challenging, my tongue twisted and tumbled. Of the very few things I was sure of in the days leading up to his death, it was by far the most clear that I would sit shiva, the Jewish mourning ritual. I draw on this memory now as my father’s yartzheit converges with this tragic political moment and our collective Jewish fumbling towards solidarity. I feel it all intensely in the mix of all my identities—as the daughter of an Indian immigrant and an Ashkenazi Jew, a Jews for Racial and Economic Justice board member, a unionist, a leftist who has served for six years on the board of an organization that studies the far right and its rise to power. The recent political violence—from the vigilante murders to the rhetorical attacks to imposed suffering of immigrants and more—can feel so intensely personal. It summons so much sorrow and grief, and draws me back to the confusing and powerful experience of sitting shiva. Shiva was unfamiliar to me, and required asking a lot of questions. I grew up without formal Jewish education, so I didn’t know the rules. I wasn’t sure if I was “supposed” to observe the rites since my dad wasn’t Jewish (not that it would have stopped me). My then-new-boyfriend did all the research, googling, and calling rabbis and more Jewishly learned friends. Our relationship was only a few months old but I trusted him totally—he’s a good guy, plus he has a PhD. (Reader, I married him.) My circle of friends is not particularly Jewish, so the Jews within it stepped up: explaining, coordinating, answering the door. We all learned together. But I never felt comfortable really saying my dad’s name in all its multisyllabic glory when I said Kaddish in shul. I usually just stood up and said, “my dad,” because, after all, “Dad” was his name to me. Sometimes I said “Krishna” and only because my shul is explicitly welcoming to mixed-heritage families. But I never got over the self-consciousness. I don’t have that problem when I stand to say Kaddish on my Jewish grandparents’ yartzheits. There’s nothing remarkable about “Rose Cohen” in the list of Jewish names, though remarkable my grandma was. At home, I sat on low chairs but felt high on the shoulders of our Jewish foremothers. My knowledge of the evolution of Jewish ritual is patchy. I know daughters are not required to say Kaddish, and that our right to do so has been contested. I was doubly grateful for my opportunity, because there was almost nothing for me to do in the Brahmin rites, which are performed by the deceased’s eldest son. I know women will work to change the rules, but in the throes of my grief I didn’t have it in me to fight for a space. Previous Jews had already had those fights, and made a space for a daughter’s grief alongside a son’s. For that, I was intensely grateful. As I’ve stepped into leadership as a Jew of color in the last few years, I know the space I inhabit in the Jewish world was carved by the organizers before me. For that, too, I’m grateful, and committed to widening our doorways a little more. After shiva and sheloshim, I went to India for two months to stay in the family home with my grandmother, my uncle and my aunt. For the first time in my lifetime of visits, I kept Shabbos. I wasn’t sure what to expect when I explained what I needed, especially the wine, which is technically a violation of the rules of the house. Many of my relatives don’t drink alcohol, but every week my uncle took me to buy wine, and every week my ajji, my grandmother, watched as I lit the oil lamps from the pooja room (where a household maintains an altar) and said the blessings over them. She skipped the wine but shared in the slices of white bread dipped in salt. I recited Kaddish, despite the lack of a minyan. Sharing the wine with my uncle each week was a special comradery, as he joked about breaking his own tradition’s rules to support me in mine. One week, my grandmother told me—my uncle translated—that it brought her comfort to watch me observe a ritual, to share in it with me. My week of shiva helped me adjust to the future staring me in the face: one without my father. I recall my personal grief today as we face the far right capture of our governance, and a collective grief after the shooting at Squirrel Hill synagogue. We must also continue to dream of the world we’ll make together. MAGA and its nostalgia are toxic not only for our politics but also our imagination. My experience with my family showed me that you don’t know where your solidarity is going to come from, so always invite it, and recognize it when it comes. And if you need translation to understand the expression of solidarity, get it. We Jews are a tiny community, full of weird and difficult and sometimes alienating rituals in languages many of us don’t speak. My dad wasn’t Jewish, but that did not diminish his enthusiastic participation in our ritual, even when he didn’t get it “right.” He never missed a seder or a break fast at my house, even when my mother couldn’t come. He showed up, and that was what mattered most. Similarly, while I sat shiva, my friends, acquaintances, colleagues, they showed up. And if they came without food or they stayed too long or talked too loud, it was fine. Because they showed up. In this moment of profound Jewish grief and sorrow, in the wake of bombs and the worst massacre of our people in US history, we too must see the many, many people who show up, however imperfectly. And we must also show up, as we now experience the dislocation, the sorrow, the confusion, the grief of an experience that so many other communities have suffered for so long. In the wake of the mass murder at Tree of Life, Jewish protesters in New York held both our own particular grief as Jews, and our outrage rooted in solidarity—joining (or re-joining) the long list of the “directly impacted.” “We are here,” Tuesday’s protesters insisted, banging on the door of the Manhattan Republican Club. It was a message as much for other Jews as it is for the white Christian nationalists and the mainstream apologists. Muslim friends joined in solidarity. Part of the power of shiva is that it takes the mourner from the immensity of the absence of the dead to the insistence on the hereness of the mourner, and the others who join us in our mourning. This moment not only reminds us of the danger we face, but also of what the US offers the Jewish community that is unique: the promise that all of us Jews, mixed or not, have a place here. We will fight alongside our siblings for a country in which we don’t just belong, but thrive. In the eight hours for what we will, Dania Rajendra concocts elaborate layer cakes, complicated cocktails, and the occasional poem.